Not much to write here except... EMILY AND I ARE DOWNHILL SKIING AT A RESORT IN JUNE!!!! Ha ha.. how many people can say that!? Timberline extended our season passes through mid-June and we were more than happy to head up there for a day of skiing. Unfortunately, the day we chose happen to be one of the cloudiest in all of June (which turned out to be a pretty wet June here compared to the average). The Palmer chair lift was completely enveloped in clouds until the last few lift towers. At that point it cleared completely to bluebird skies and a ton of sun reflecting off the Palmer Glacier which everyone was skiing. We could see climbers heading up the mountain towards the Devil’s Kitchen and watched as skiers and snowboarders descended down into the clouds below. We were able to ski all the way back down to the Magic Mile chairlift but only did that once since it was so cloudy with visibility nearly at zero. 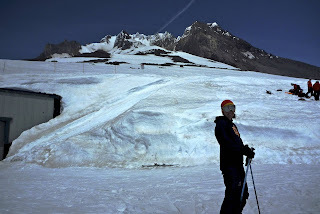 I was forced to ski slalom between bambo poles marking the edge of the trail just to see where I was going to prevent nausea from the lack of visibility. On the chairlift up it was creepy to not be able to see the lift towers or even other chairs around you. It was like riding a steel cable into the abyss. We skied for about 4-5 hours and then headed back to Corvallis for the night.